Many people have written asking where to get Hawaiian implements like the ones in our header. These were made by the artisans of Kumulau. 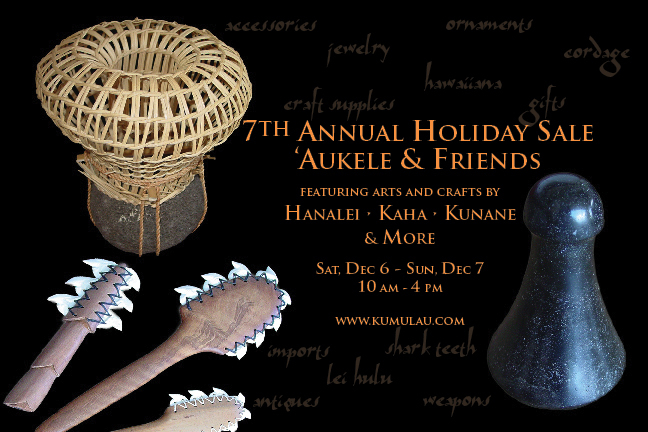 Kumulau will be having a private sale in Honolulu on Saturday, December 6 and Sunday, December 7, 2008. At the sale, there will be all sorts of Hawaiian arts and crafts such as kahili, kūpe‘e, ihe, hīha‘i and ki‘i pōhaku. They will also have the some of the supplies necessary to make your own implements. From cordage to sharks’ teeth, it’s a great place for Hawaiian artisans to get hard to find supplies. If you would like to know where the sale is, please send us an email at aina.aloha at yahoo dot com. In appreciation for bringing their artistry to Hawai‘i, Mayor Mufi Hannemann and the children of Kawaiaha‘o School gave the cast of Cirque du Soleil’s Saltimbanco a warm mahalo – Hawaiian style. After the performance on Thursday evening, the children and Mayor joined cast members on stage. Bearing lei, the keiki first offered an oli mahalo in which they chanted their gratitude for the show choosing to come to Hawai‘i. After the oli, the children presented each of the 50 cast members with lei and honi (the traditional touching of the noses to share the breath of life). Mayor Hannemann presented singer Nicola Dawn (representing the entire cast) with a pū‘olo or bundle of sweet potato and Hawaiian salt wrapped in ti leaves. This gift symbolizes the fullness of life with staples from the mountains and the sea.